2 x Brilliant Brownie Squares 70g - wonderfully chunky and luxuriously rich! Milk and dark Belgian chocolate mixed with a little magic these chocolate chip brownies are not only indulgent, but a piece of pure heaven! A Brownie that any Girl Guide would be proud of! 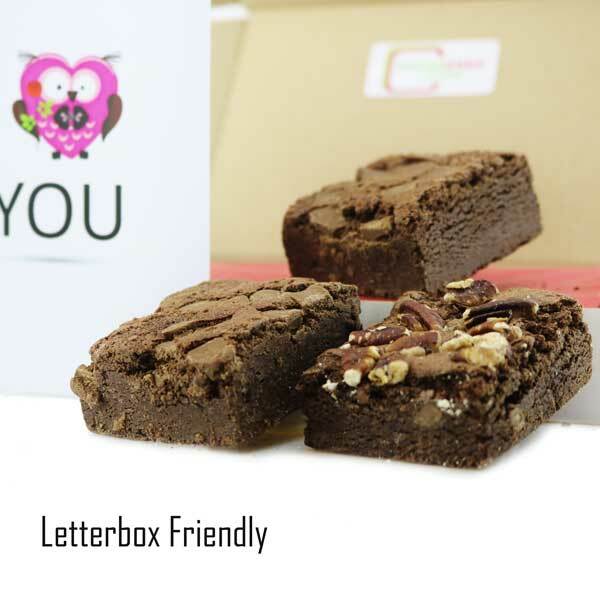 Pecan Brilliant Brownie 70g - a magnificently nutty brilliant brownie square made with lashings of Belgian chocolate and topped with deliciously baked pecans, it's one to go nuts over! A great gift for a family or even your aunty and uncle, don't forget your cousins too, they all like a treat! I brought this poke for an extra little valentines treat for my husban d he's had the brownies before and was very pleased to have 3 ALL to himself needless to say they didn't last very long. Will definitely order again . I've sent a lot of sugarpokes and I think this is my favourite - these Brownies are sublime!